With smartphone users nervous about their handset being a conduit for espionage, and looking for a search engine that doesn't share information, one might say that DuckDuck Go Search & Stories fits the bill (but only if one had a penchant for corny puns). Available for iOS, Android and even the Amazon Marketplace, the app will be your search engine, but will not share any of your information. 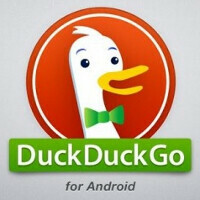 DuckDuckGo Search & Stories started as a desktop search engine and has spread it's, uh, wings to mobile. It doesn't offer results tailored to individual users nor does it ask for your personal information. The app offers hundreds of sources for searches and not only will it auto-complete a search, it also will do so for a answer. The app will also provide you with stories from many top sources like the New York Times, The Wall Street Journal, ESPN and Yahoo. With the recent news about the NSA's PRISM program shaking up smartphone owners, using DuckDuckGo Search & Stories might make you feel a little more secure about the safety of your personal information. Plus, you can't help liking the cute name.